Linksys AE2500 is a dual-band wireless n USB adapter which is backward compatible with 802.11a, b and g devices. It can operate in both 2.4GHz and 5GHz and it helps a lot to reduce the influence of interference. It is better in performance compared to AE1000. It has two antennas and works properly with the Cisco Connect software. However, AE2500 is not compatible with MAC and still, users complain about getting compatibility issues with Windows 8 computers. It works properly with Windows XP, Vista and Windows 7. Linksys AE2500 11n USB adapter comes with a setup disc which helps hassle-free installation but some users complain about issues with automatic installation. 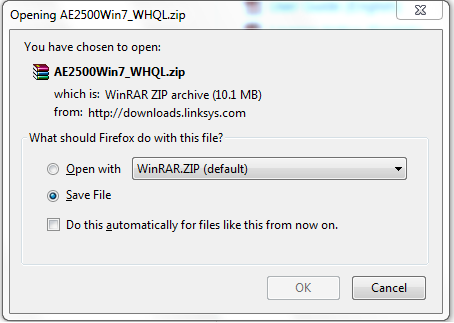 This tutorial explains how to install Linksys AE2500 on a Windows PC with the latest driver. If your computer shows issues with installed AE2500 USB WiFi adapter, you may uninstall it from the device manager and try to install manually. This tutorial will guide you the process. 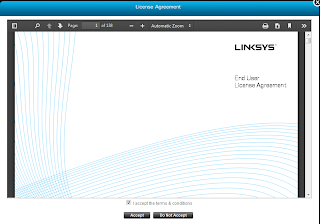 To download the latest driver for this wireless card, you must visit the Linksys support website. Go to the link below and click download. Select the version of the Wireless Card and select the Operating System running on your PC. 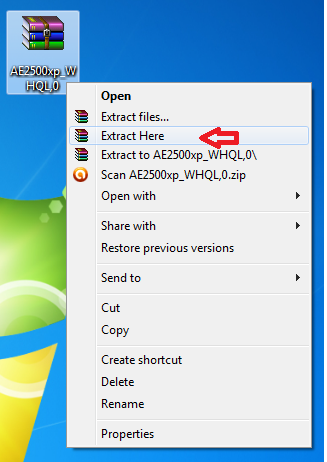 Right now AE2500 USB card supports Windows 7, Vista and XP only. So if your computer is having Windows 8, AE2500 will not work properly because there is no Windows 8 driver. If it is a fresh installation, you do not need to follow this step. If AE2500 WiFi card is already installed, you must uninstall it from device manager. Device manager can be accessed from Control Panel. To learn more about steps to access device manager, follow the instructions provided in the link below. In device manager, your WiFi card will be recognized as an unknown device under other network adapters with a yellow symbol. 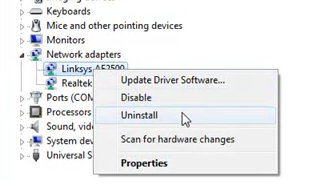 You may need to right click on it and click on install driver/ update driver option. When you are prompted to select the location of the driver, browse the location where the extracted file of the downloaded driver is saved. Step by step instructions is provided below. 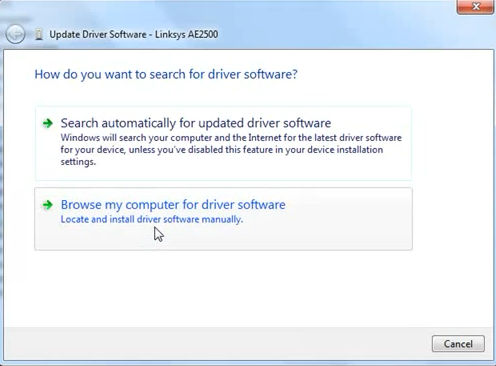 Select the option "Browse my computer for driver software"
Now select the file location and follow the instructions. You may need to click next button to continue installation. Even after the successful installation, you may face troubles with USB WiFi cards. Here, we have provided some common wireless connectivity issues with solutions. If you see the status of ae2500 wireless card as disabled, you may follow the instructions provided in the link below. Another common problem users face with Linksys ae2500, ae1200 or ae1000 is the driver incompatibility issues. 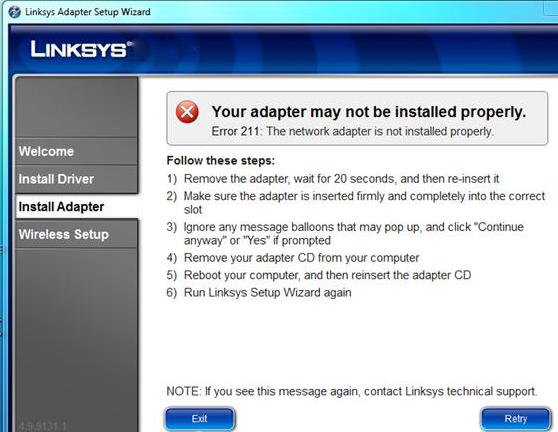 You may note that Linksys releases these USB WiFi cards drivers for Windows 7, Vista and XP only. If you are installing the ae1200 adapter on MAC, you will see incompatibility issues. You may see the same error with Windows 8 too. Sometimes while installing ae1200 or ae1000 adapter, you may get error 211 particularly on Windows 7. You will also see an error message "Your adapter may not be installed properly". See the image below. 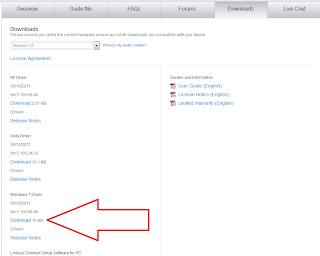 Here the solution is to install the driver software manually. One of the common problems users face is the frequent wireless disconnection of Linksys ae1200 and ae2500. In case if you are continuously seeing frequent WiFi disconnection, I recommend you to follow the instructions provided in the link below. If all the current wireless channel your Access Point or router using to broadcast signals is overloaded, Linksys USB adapter AE2500 may get limited access message. You may either change the current wireless channel or follow the instructions provided in the link below. You may receive this error message if you are trying to install AE2500 on a Windows 8 PC. As I said before till now Linksys has not released Windows 8 driver software for this adapter. As a workaround, you may try to install Windows 7 driver and try to scan wireless networks. AE2500 supports 300 Mbps WiFi data transfer speed. However, it depends on the speed of Wireless Access Point and Router. Though ae2500 is faster, the data transfer speed over WiFi depends on the WiFi standards supported by router, interference, distance etc.